I used to love hotels. The abundance of fluffy pillows and fresh towels, that I don’t have to personally wash. The pool, gift shops with funny local nicknacks, and always the breakfast. Hotels were a fun break from reality. That, was before we had a traveling toddler in tow. Now, I walk into a hotel, and immediately 20 things stand out. 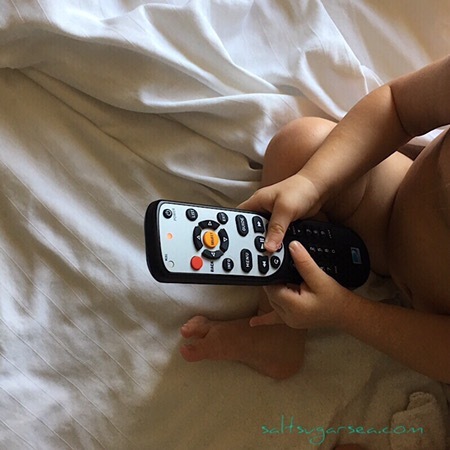 20 plus things, that I have to keep our toddler safe from. Uncovered light sockets, glasses on the night stand, lamps, cords, trash cans, the toilet. There’s danger everywhere! On top of this jungle of potential hotel hazards, a traveling toddler is one wiggly travel partner. This travel partner has been sitting in their car seat for way too long, and are full of bursting energy. The traveling toddler needs to explore. This is exactly what happened in our last hotel stay. Our Tiny Tot needed to be free. While The Husband stayed stuck to his computer, Baby and I did a little exploring. This was a roadside hotel, not a vacation hotel. We stopped here out of necessity. Meaning, we could drive no further, and it was too hot to sleep in the Camper Van. This Hotel was, by no means, full of anything extraordinary. We had to turn ordinary things into extraordinary things, and search for fun. Surprisingly, there was actually quite a lot of fun to be had, if you took the time to look. 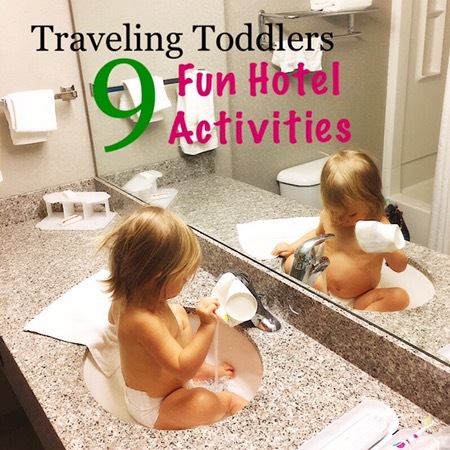 There are many fun activities to explore at any hotel, that will bring delight to a traveling toddler. This was, by far, our Little One’s favorite hotel activity. Allowing the faucet to just trickle, we started by just dipping her toes in the sink. She splashed, and giggled and eventually scooted right into the sink. I handed her one of the cups near the ice bucket. She filled and emptied that cup to her heart’s content. Open. Close. Open. Close. Open. Close. Open. Thow a toy in the drawer. Close. Open. Retrieve the toy. Repeat. I remember loving this when I was a kid. As Mom was making the bed, we would run and jump in it. Holding two corners of the bed sheet, she would fly it up high in the air, so it could drift down slowly on top of us. Stacking the pillows all around us, we would giggle as we climbed out of the pillow fort, and begged to do it again. This was a hit with Baby too. Walk up and down the halls and let them go ahead a little. Make sure there are no open door or stairways that they could reach before you. Stop to look at pictures, and point things out to practice words, colors, or counting. This was a huge hit. Our Toddler loved pulling all the flyers out of their slots, and putting them in the bottom of the coke machine. This one is a great activity for parents too (as you’ll be the one putting them all back). The simple enviornment change from land to water is an adventure all in itself. A splash, a kick, a little bubble blowing. Even if it’s just to dip their toes, they will have fun in the water. The magical pool in the picture below is the best hotel pool we have ever seen. Fed by a natural hot spring, even with snow on the mountains in the background, Baby stayed cozy enough for lots of splashing and play. Eating, and seeing new people is always full of stimulation for a toddler. If the hotel offers complementary breakfast, they will probably have some type of sugar O’s cereal. Empty a handful into the table and help your little one sort the colors. You can also drop them in a cup, which makes a pleasing sound. Or grab two cups, and hide a cheerio under one of the cups. Have your toddler guess which cup has the cheerio. So much fun! This is where the best mirrors in the hotel are hidden. 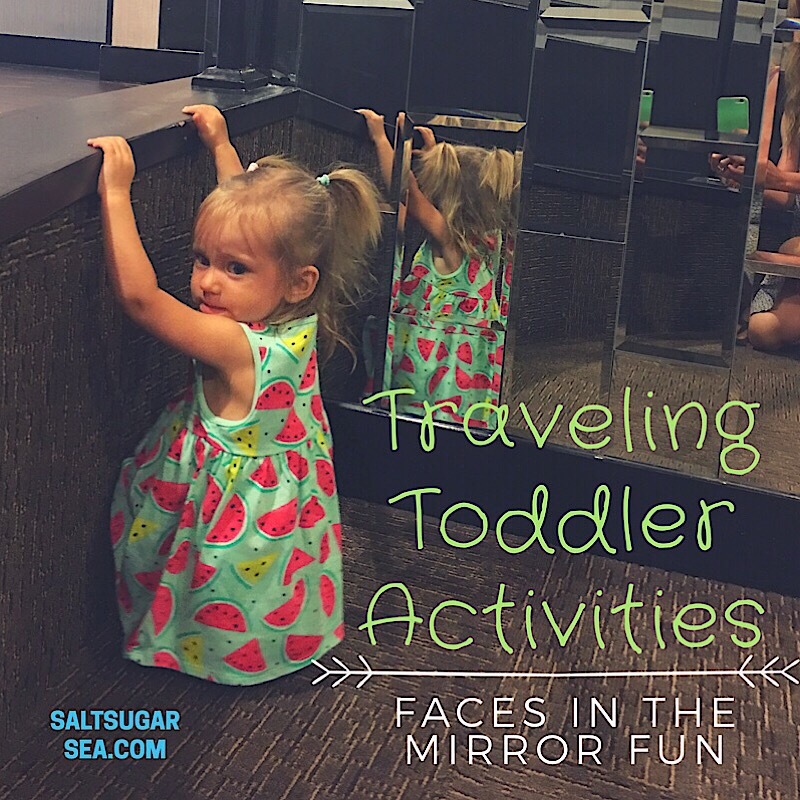 If the fitness room is empty, you and your little one can have a nice game of “faces in the mirror”. Please Note * As with all toddler adventures, these fun activities should always be closely supervised to insure a safe and happy toddler. This post contains some Amazon Affiliate links, meaning if you purchase any of these cool Baby things via the links below, Amazon may give me a high 5 and potentially a small % as a thank you for sending you their way. There is no cost, no fee, no charge to you and this is a great effortless way to support this blog. Thanks so much for being here!